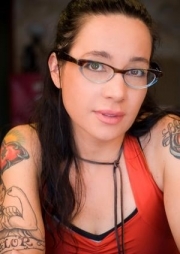 Janeane Garofalo is an American stand-up comedian, actress, left-wing political activist and writer. She is the former co-host on the now defunct Air America Radio's The Majority Report. Garofalo continues to circulate regularly within New York City's local comedy and performance art scene. Garofalo was born in Newton, New Jersey, the daughter of Joan and Carmine Garofalo. Her mother was a secretary, in the petrochemical industry, who died of cancer when Janeane was 24. Her father is a former executive at Exxon. Garofalo was raised as a conservative Catholic and is of Italian and Irish descent. She grew up in various places, including Ontario, California, Madison, New Jersey — where she graduated from Madison High School — and Katy, Texas. Garofalo is quoted as having disliked life in Houston because of the heat and humidity and the emphasis on prettiness and sports in high school. While studying history at Providence College, Garofalo entered a comedy talent search sponsored by the Showtime cable network, winning the title of "Funniest Person in Rhode Island." Her original gimmick was to read off her hand, which was not successful in subsequent performances. Dreaming of earning a slot on the writing staff of the TV show Late Night With David Letterman, she became a professional standup upon graduating from college with degrees in History and American Studies. She struggled for a number of years, even working briefly as a bike messenger in Boston. Garofalo has described herself thus: "I guess I just prefer to see the dark side of things. The glass is always half empty. And cracked. And I just cut my lip on it. And chipped a tooth." Whole or part of the information contained in this card come from the Wikipedia article "Janeane Garofalo", licensed under CC-BY-SA full list of contributors here.